Enjoy clearer sound during telephone conversations or when listening to the TV, radio, tape recorder or a computer sound card. In addition to the abilities of the basic HGA-TP unit, the Speech Adjust-A-Tone HGA-HTP can also be used with a headset with a boom microphone while using the telephone, plus it can be used with an external microphone to pick up room conversations. 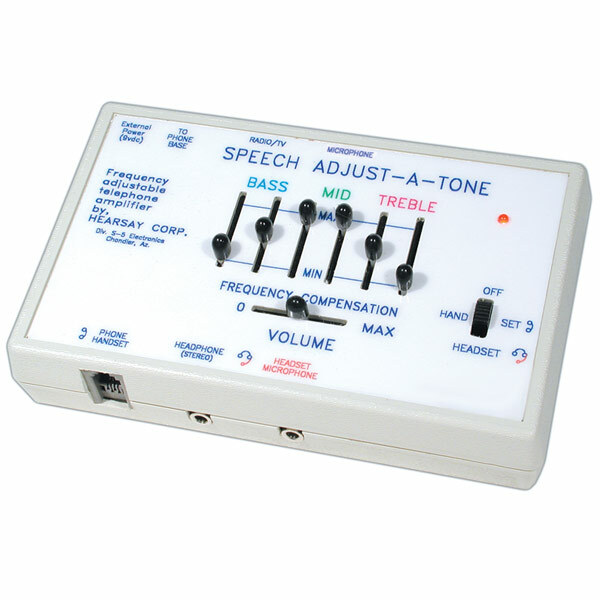 Speech Adjust-A-Tone is more than amplification. Six adjustable frequency ranges can adapt to each person's particular hearing loss and thus aid in speech discrimination as well as amplification. While listening to television, radio, tape recorder or computer sound card, the hearing impaired user wears headphones and can adjust the volume control and frequency controls for optimum clarity. Others in the room are not disturbed. It can be used with the old style carbon microphone or the newer electret microphone equipped telephone sets. Use it with a telephone and the optional Headset w/Boom Microphone for hands-free operation. 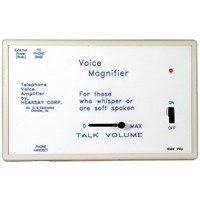 It also has an input for a remote Microphone to pick up room conversation. The HGA-MX includes a Telephone Receiver Cord, a 9 Volt Battery and a 1 Year Repair or Replace Warranty. Speech Adjust-A-Tone HGA-HTP- Boom Mic Compat.